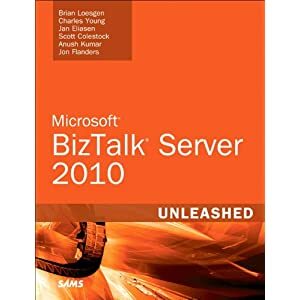 BrianLoesgen.com - Blog.BrianLoesgen.com - BizTalk Server 2010 Unleashed has shipped! BizTalk Server 2010 Unleashed has shipped! I am proud to say that BizTalk Server 2010 Unleashed has finally shipped. This is my eighth book. It never ceases to amaze me how long this process can take when you’re working with a bunch of highly-skilled super-busy individuals. This book is actually the second BizTalk “Unleashed” book I have done. The first was back in the days when BizTalk Server 2004 was released, where I had the honor of working with Scott Woodgate (that name means something to longtime BizTalkers) and Stephen Mohr on BizTalk Server 2004 Unleashed, which was at the time the definitive reference book for BizTalk developers. It was an honor working with this stellar team to create this book. I’d also like to thank the team at SAMS for their professionalism and great work throughout the process. Somewhere along the line, we doubled the size of the book, an indication of the depth of the content we incorporated into it. So BizTalkers, there you go, you can order it now. Enjoy!